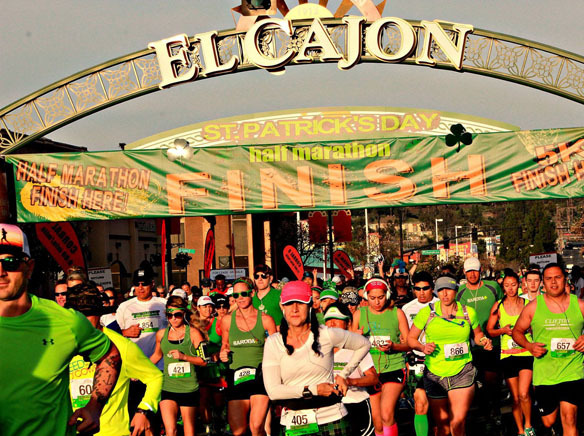 El Cajon’s Mayor Bill Wells proclaimed, “Forget the miles, remember the glory.” And green Irish glory of all kinds—tutus, kilts, green t-shirts and more were seen in droves on the runners at the 3rd Annual St Patrick’s Half Marathon & 5K on March 15 in downtown El Cajon. Anne Ebert, with the Run EC Foundation who ran the event, said around 2,500 participants showed up to do either the half marathon, green mile fun run, or 5k. 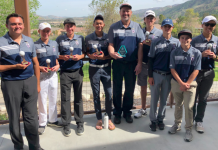 The marathon, an idea that was created in the El Cajon Chamber’s idea machine, the Future Vision Project, raises money, around $35,000 last year, for persons with disabilities. Not only did schools, military branches, and running groups show up before 7:30 a.m. to warm up and stretch, but those who manned vendor booths, representatives from breweries, food trucks, and bagpipers in kilts played authentic Celtic songs at the start of the day. Nonina Cox from Reno, Nevada came with her daughter that works at the local Seal Command Center. “I ran years ago but today I’m doing it with my kids,” she said. Not only did it have a range of participants, it is a USATF certified race, with running clubs but also had participants in wheelchairs or that used walkers. Walking was also an option. Chula Vista residents Stevan Perez and Alec Harris called it a draw as they sped thru the finish line for the one-mile race. They estimated their time to be between 4-5 minutes. Prize money was allotted for the top competitors but most were handed medallions on a lanyard. All winners will be posted on the race’s website at www.stpatricksdayhalf.com. Vendors were in place as well for a range of businesses or groups. A vendor, Herbin Acupuncture & Wellness provided free stretches. Dr. J.P. Yurgel, chiropractor, stressed the importance of preparing for a race with the appropriate stretches from the hips down to the arches. Other contests such as the leprechaun challenge, costume contest for the best Irish outfit, and other competitions that either provided a medallion or bragging rights were held from noon until closing time of around 4 p.m. Bands were scheduled all day starting out with the group Raggle Taggle at 9 a.m.
Local spirit raiser, Sunshine Horton, was dressed up in the de rigueur outfit for an Irish event as a leprechaun. After all what’s an American-Irish event without a leprechaun?